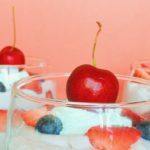 These Dairy-Free Strawberry Vanilla Mousse Parfaits are delicious, dairy-free, vegan, and refined sugar-free. 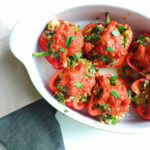 They’re an amazing healthier summer treat or addition to your 4th of July BBQ! The 4th is almost upon us. Which means I probably won’t be watching fireworks, but trying to calm my dog down and hiding in the bathroom (her “safe place”) with her as she freaks out. And it also means BBQs, beers, hot dogs, and mostly all unhealthy (but kind of delicious) things. And I’m okay with that. Like I’ve said and will always say, I am all about balance. I am totally fine with pigging out during the holidays and eating a huge slice of birthday cake. I don’t even think twice about having some not-so-great-for you goodies during weekend cheat days. But I don’t do it all the time. I’m definitely not stick skinny. I never have been. I’m also on a medication that causes major weight gain and I’ve put on 15 pounds in the past 2 years that’s impossible to get off. But, I’m okay with it. I’m healthy. I eat a really great, balanced diet 90 percent of the time. And I work out. I go to the gym. I do yoga all of the time. I almost never eat processed foods. The most important part of our health is eating well, moving, staying active, and feeling comfortable in our bodies. Love yourself and do what’s right for you. An example of my balance? Today, before shopping at Whole Foods and buying a ton of organic, healthy produce and ingredients for the week, we totally ate a giant Chicago-style hot dog from the family-owned hot dog hut next door. And french fries. And it was delicious. We also walked 2 miles to Whole Foods so I didn’t feel too guilty. But that’s just what works for me. With that being said, however, I’m always trying to make something fun, but healthier, for parties and holidays. Something to balance things out. So I knew I would be chowing down on some grass-fed cheeseburgers for the fourth, so maybe my dessert didn’t have to be that terrible for you? 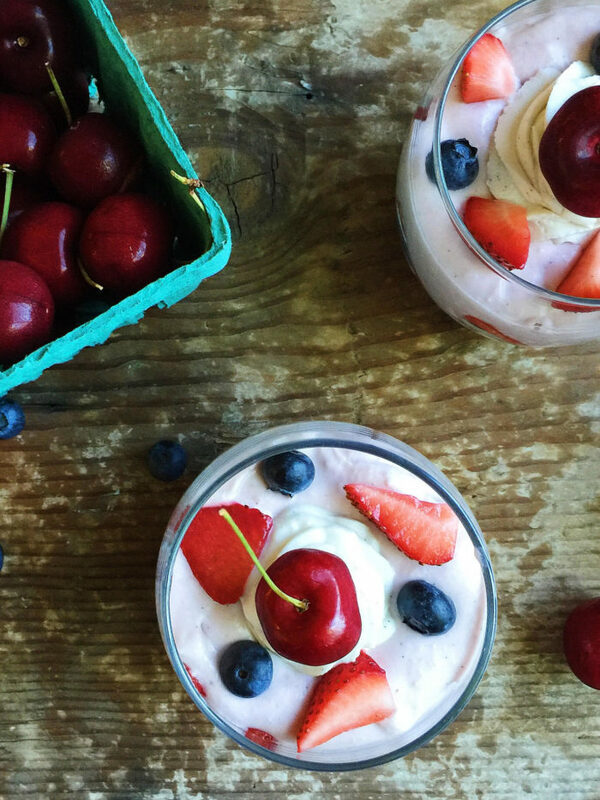 Hence, these dairy-free strawberry vanilla mousse parfaits. 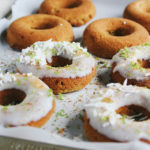 They’re made with whipped coconut milk. (So, delicious already, am I right?) They don’t have any sugar or any dairy. 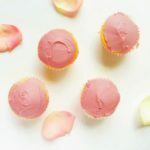 They’re lightly sweetened with vanilla bean and a little agave. They’re layered with ripe, fresh berries. And they’re so good. Use a high-quality brand of vanilla bean for this recipe, such as Rodelle. I love their Madagascar vanilla beans for their pure, true vanilla flavor and quality. 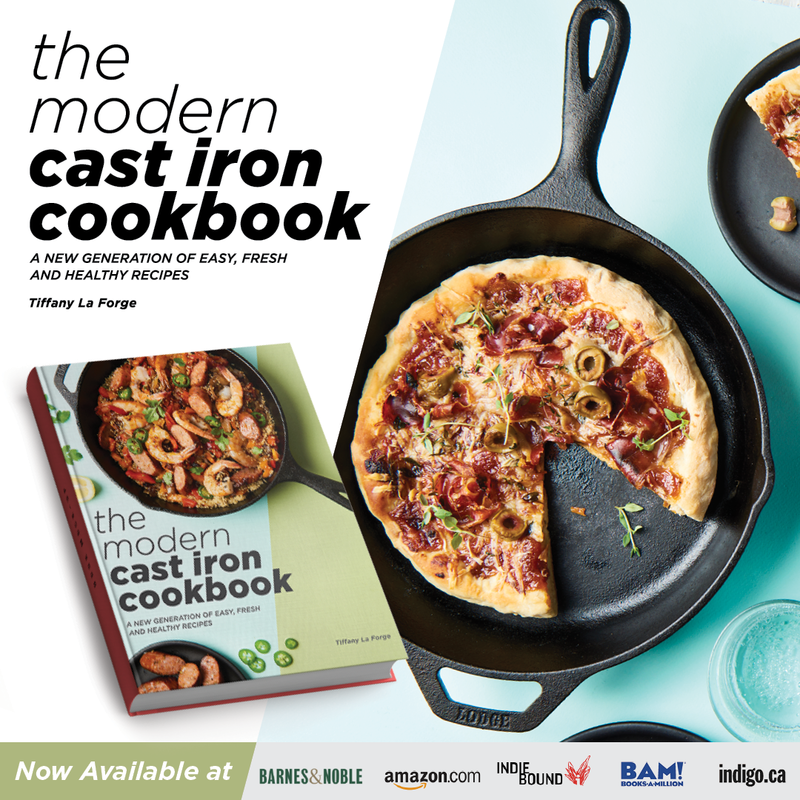 Also: this recipe is so easy. Just 5 ingredients and minimal effort. 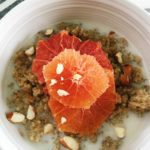 And you can have something delicious, quite pretty, and healthy for dessert! 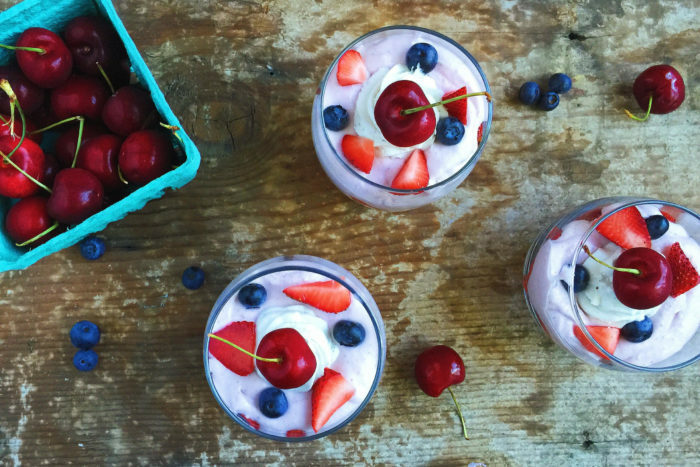 Enjoy these dairy-free strawberry vanilla mousse parfaits, and have a happy Fourth! 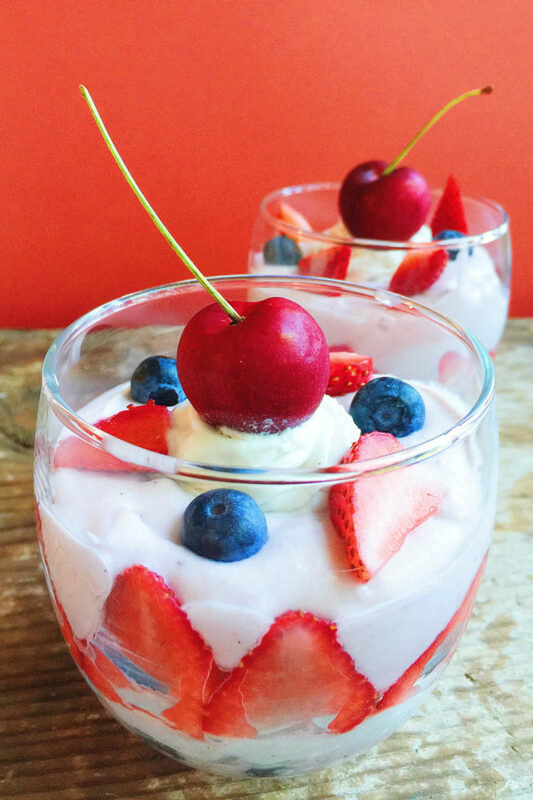 I hope that you enjoy this Dairy-Free Strawberry Vanilla Mousse! Have you ever made coconut whipped cream before? 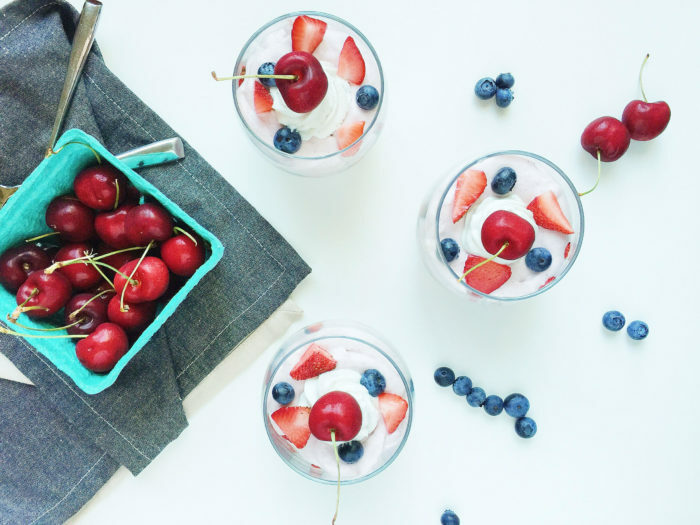 What’s your favorite healthy summer dessert? Let me know in the comments below! 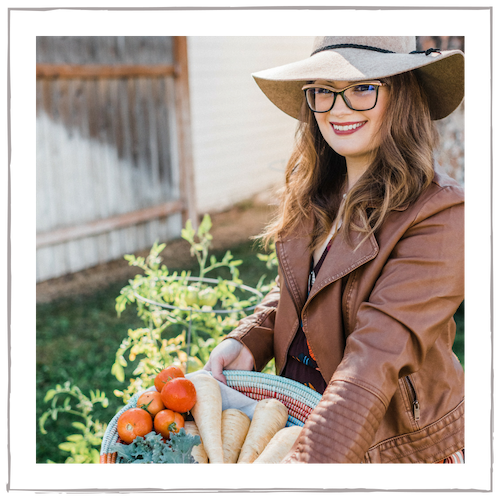 This post includes affiliate but are always products I love + highly recommend! 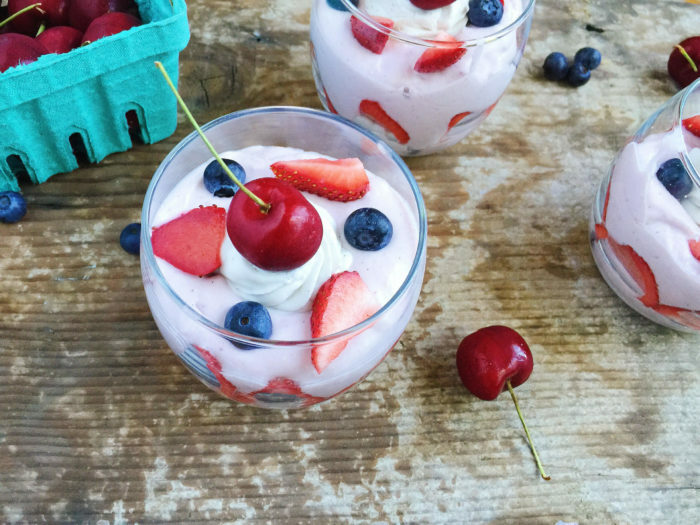 These 5 ingredient Strawberry and Vanilla Bean Mousse Parfaits are delicious and super easy. They contain no refined sugar or dairy and are vegan. 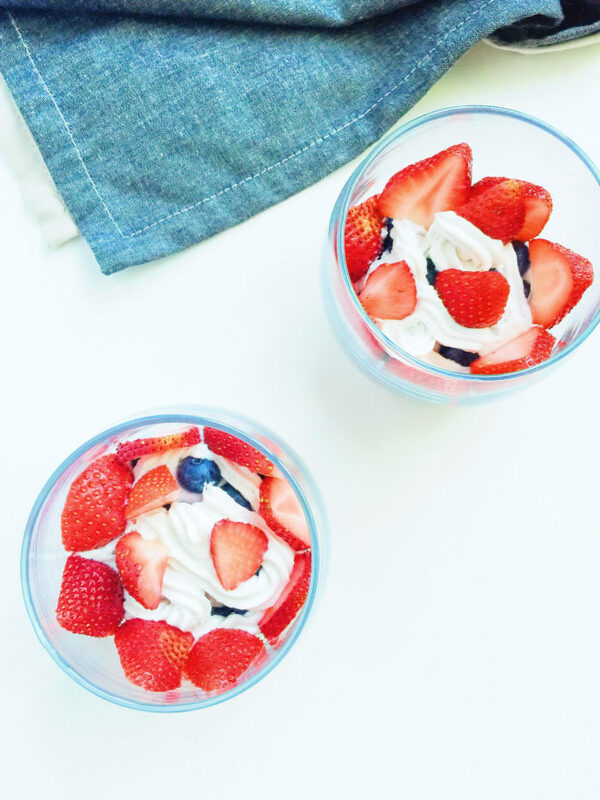 Lightly sweetened with real vanilla bean and raw agave nectar, these fruity parfaits are a healthier, but still decadent, treat. 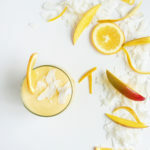 Place the cans of coconut milk in the refrigerator overnight. Puree about a half pound of strawberries to make strawberry puree. Strain the puree through a fine mesh strainer and measure out 2/3 cup. Make the whipped coconut cream. Remove cans from the fridge and open the cans from the bottom. 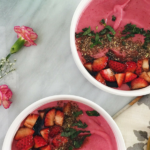 Carefully drain out all of the water and reserve it to make smoothies with at a later time. You will have the solidified coconut cream left in the cans. Scoop all of this out into your standing mixer bowl. With the whisk attachment, whip the coconut cream until thick, fluffy, and stiff, about 3-5 minutes. Scrape the seeds from the vanilla bean and scrape into the bowl of coconut whipped cream (save the vanilla pods to make vanilla sugar). Add the raw agave nectar and beat another 30 seconds. Scoop out about 1 cup of the coconut whipped cream and reserve in the fridge until ready to use. To the remaining cream, add the strawberry puree slowly while beating. Beat another few minutes until stiff and incorporated. 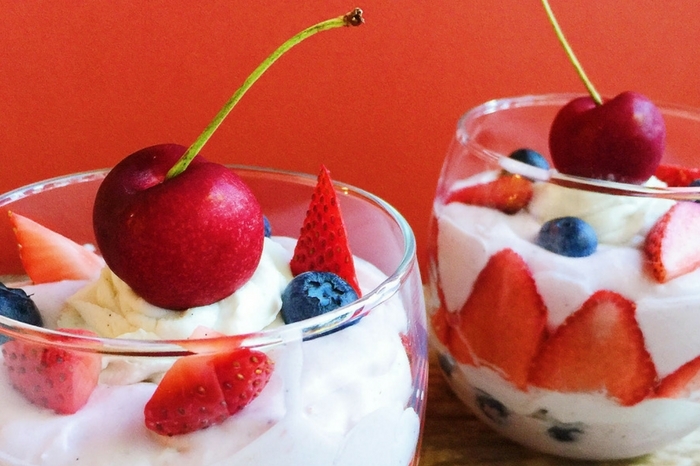 Layer the parfaits. On the bottom of each glass, spoon or pipe some of the strawberry mousse. Then add a layer of sliced strawberries and blueberries. Repeat this two more times. 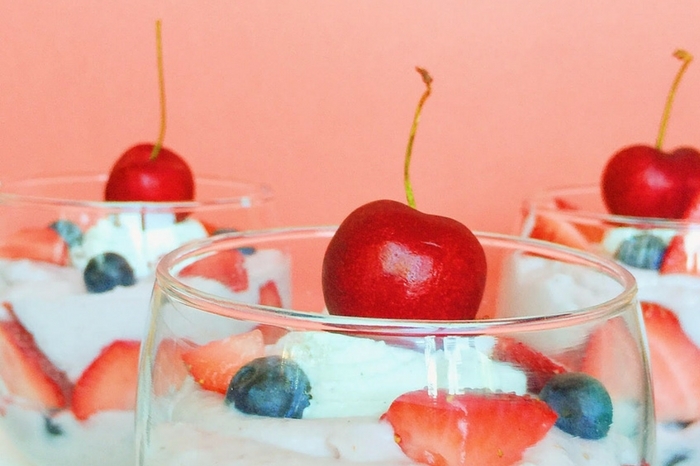 Top parfaits with the reserved plain coconut whipped cream. Chill parfaits, covered in plastic, in the fridge for about an hour. Enjoy! I know! The vet gave her tranquilizers for the 4th. Poor little Puff!